Photos on iOS 8 are so good that you will be able to ditch a whole home-screen folder’s worth of editing and organizing apps. That’s not an exaggeration: Apple’s new mobile OS packs in so many great new features that – even without the extending abilities of iOS 8’s new plug-ins – you can do pretty much any edit right there in the photos app. The camera, too, has gotten an upgrade, and – maybe the most important for some – so has the iCloud Photo Stream, which will now give access to all your photos, from any device, whenever you want. The camera is the first place you’ll notice new features. It looks almost exactly the same as in iOS 7, only now you have a some extra controls. Along the left side, you’ll see a new section called Time-Lapse. This sits next to the Video, Photo, and Square tabs, and is accessed by swiping or tapping, just like those. It does what you’d expect, snapping frames at short intervals and building them into a herky-jerky MOV movie. To be honest, you’re better off using Instagram’s Hyperlapse app for most stuff, but this is cool for real-life time lapses. 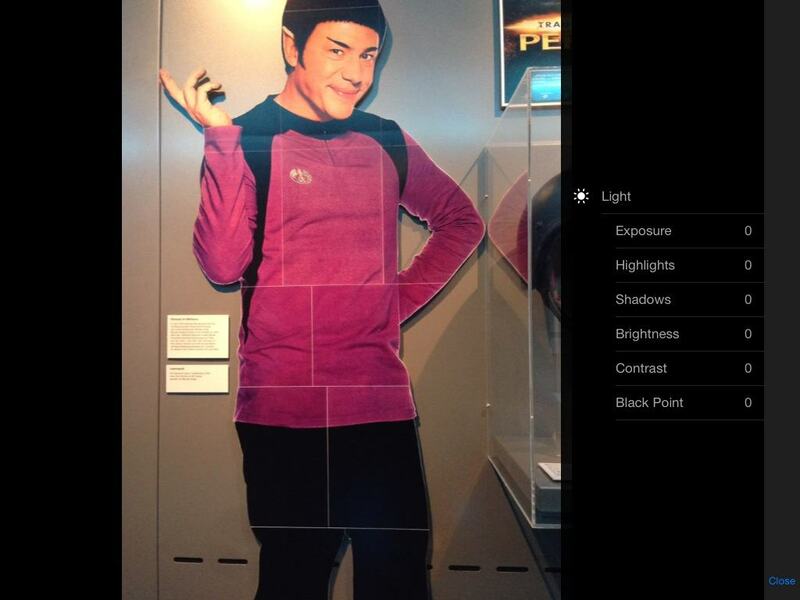 If you pick a one of the still photo options, you now get an option to use a self-timer. This gives you a three or ten-second countdown timer, and pulses the iPhone’s flash to tell you it’s working, finishing with one big flash to let you know it’s done. On the iPad, you don’t get the flash part, obviously. This one is rad, and even works on hardware as far back as the iPad mini (iPad 2). 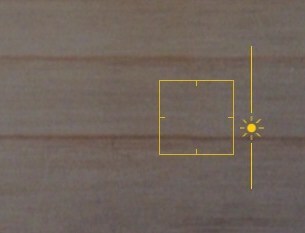 If you tap-to-focus (or tap-and-hold to lock focus) then a little sun icon appears next to the yellow box. You can swipe up and down on this icon to manually set the exposure. This is great, as it means you no longer have to wiggle the camera and lock focus on something light or dark just to set the exposure where you want it. Also, third-party developers will have access to these manual controls, so expect some enhanced photo-taking apps soon. My first-gen iPad mini now has HDR mode, which is didn’t under iOS 7. That’s pretty great, as it improves the low-light performance of the lower-spec camera. Editing is where the big changes have happened, on the local hardware at least. At first, the interface doesn’t seem to have changed at all. Hit the Edit button and you’ll notice that the Rotate and Red-Eye buttons have gone. Rotate is now inside the crop tool, and works a lot like the old rotate tool in iPhoto for iOS, with a neat graduated circle that you can drag to spin the picture (you can also just hit the little box at top right to rotate by 90˚, like before). Fine-tune edits or just lat iOS take car of the details. But the biggest changes come when you hit the new “Volume Knob” control, which Apple calls Smart Adjustments. There are three new Smart Controls – Color, Light and B&W. Tap one and you get a strip that you can swipe to tweak the colors, exposure or B&W mix of the picture. But if you swipe up (or to the left in landscape) then you get access to the manual controls that power the Smart Controls. 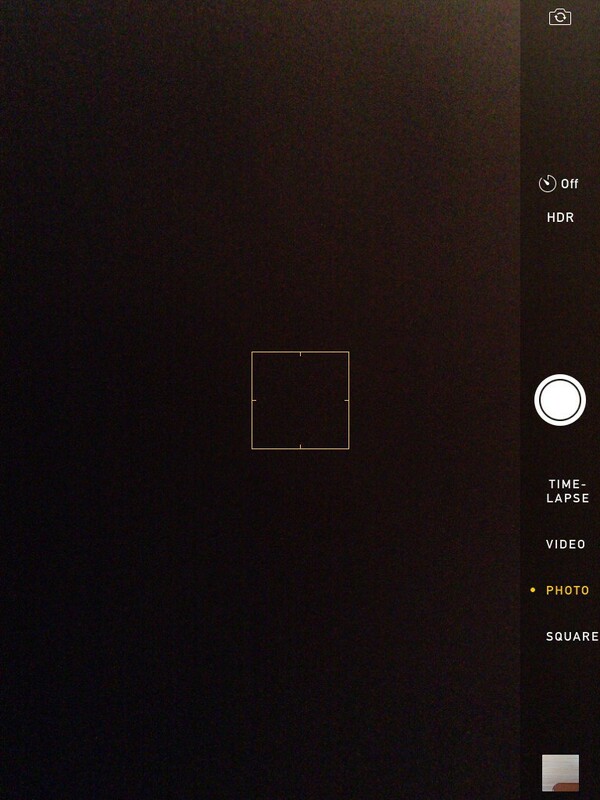 For instance, under the Light control you’ll see sliders for exposure, highlights, shadows, contrast and black point. Therefore, just by swiping up and down, left and right (to switch sliders, and to control those sliders) you can edit every aspect of your photo. It’s a lot like Snapseed in that regard. Finally, all your edits will be synced across any devices that share your iCloud Photo Library, and you can pick up editing on another device, or even revert to the original at any time. And all your favorite photo filters remain. iCloud Library is a replacement for Photo Stream. As of this writing, the old Photo Stream will still be available for those who don’t want to switch, but who wouldn’t? iCloud Photo Stream looks awesome. The idea is that you have one photo library, stored in iCloud. All your photos, from your iPhone, iPad and even your cameras (the service supports uploading RAW files) are on Apple’s servers, and you can browse this entire library from any connected device. 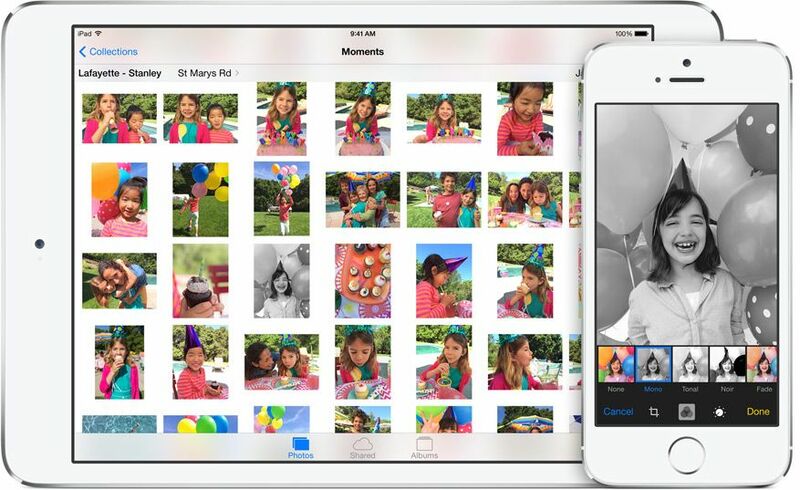 Right now that means iDevices, but in the new year (early 2015) there will be a matching Photos app for iOS. Any albums you make on one device are mirrored elsewhere, as are any edits, removing confusion about albums made on your iPhone/iPad vs. albums made on your Mac and synced via iTunes. Another small change is that, if you decide to edit a photo that’s stored in your Photo Stream, you now get asked if you want to duplicate and edit the photo, instead of being prompted to save it to the camera roll. Gone, too, is the 1,000-photo limit of Photo Stream. You’ll need to buy more iCloud storage from Apple, but it’s cheap, starting at $1 per month, and (according to the WWDC announcement) 200GB for $4 per month. Accidentally deleted a photo? No worries. The behavior of your photo library has changed in iOS 8. That first thing you’ll notice is that the Camera Roll is now called Recently Added. 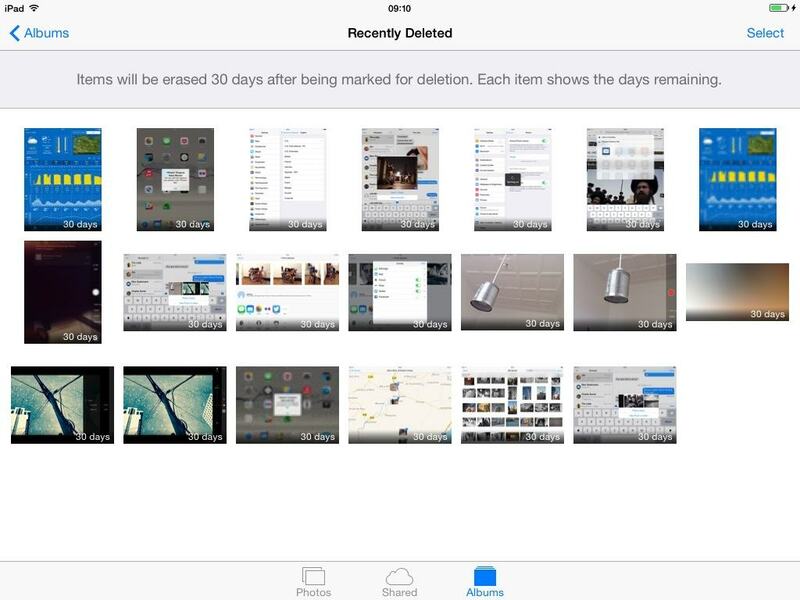 You’ll also see automatic albums created fro Videos, Panoramas, Time-Lapses and another called Recently Deleted. This last is a kind of trash basket for your photos, and lets you recover your deleted images for up to 30 days. You can also delete the images forever if you’re sure you want to. iOS 8 also introduces Favorites. Tap the heart-shaped icon next to any photo to add it to your favorites. Those favorites are added to an album called – surprise – Favorites. It works just like the Favorites in your Photo Stream, but right now the two aren’t integrated. To help navigate this new mess of photos, Apple has aded a fantastic new search feature to your photos. It uses natural-language searches to narrow down your photos. Type in “Nearby,” or “One year ago,” and get just that. It’s pretty impressive – enter “Home” as a search term and it will show you photos taken in your neighborhood. Recent searches stay in the drop down list for easy access, making them the equivalent of ad-hoc, short-term smart albums, and you can make regular albums right from the search results. Selections are easy in the new search results view. To help with this last option (and also to help with bulk sharing), there’s a button to select all photos together, and when they’re selected the button swaps to deselect. It’s a small but helpful change. Plugins show up in the sharing dialog, just like the Flickr and Twitter sheets of old. Possibly the biggest feature in iOS 8 – and not just for photos – is plugins and extensions. These essentially let you use two apps at once, sending a picture or snippet of text or a whole documents to a mini-version of another app, all without leaving the comfort of the current application. For instance: While in the built-in photos app, you could call up the filters from another photo app and use them, all without leaving Photos. The example Apple uses is Waterlogue, an amazing app that makes your pictures look like watercolor paintings, and not in a tacky way. The resulting image is saved into your library, but the original remains untouched should you wish to revert at any time in the future. I’ve been using iOS 8 on a first-gen iPad mini, and the thing I like the most about the new OS is the photos app (along with plugins, which are a game-changer in terms of how you’ll use your iPhone and iPad). It’s easily the best way to browse your pictures, and the new editing tools put it near the top of the list of editing apps too. But it’s those plugins that will make the difference. Filters are a start, but I can imagine plugins for viewing detailed metadata about your images, or for adding geotags to pictures taken on a regular camera and loaded into iCloud. And the best part is that all this can happen without creating endless duplicates of your pictures.